Themed as “development trends and opportunities of components industry” and “outlook on industrial innovation and application trends,” the IT Industry Forecast for 2018 was held by TrendForce, a global provider of market intelligence on technology industries, at the Jumeirah Himalayas Hotel Shanghai on October 26, 2017. The event was attended by 500 professionals ranging from talents of such high-tech industries as semiconductor, artificial intelligence (AI) and network communications to representatives of financial institutions and mainstream media. The symposium was kicked off by an opening speech delivered by Dr. C. L. Liu, president of TrendForce. Also, Dr. Yan Xiaolang, vice chairman of China Semiconductor Industry Association (CSIA) and head of professionals group on the construction of demonstration microelectronics college in China, participated in the conference and shared his insights on the global technology industries. The latest analysis of the DRAM market by applications forecasts that PC DRAM prices will increase by 60% on average in 2017 compared with 2016. Thanks to the strong shipments of smartphones worldwide, mobile DRAM has already claim the largest market share among the different categories of DRAM products. As for server DRAM, this category has seen the fastest demand growth driven by cloud computing and big data. Ken Kuo, research vice president of TrendForce’s memory division DRAMeXchange, pointed out that the global DRAM bit output is estimated to grow by nearly 20% for 2017, lower than the average level of recent years. DRAM supply has been tight on account of the slowdown in technology migration and the conservative stance towards capital spending as DRAM suppliers aim to keep their profits high. TrendForce expects the DRAM industry in 2018 to be dominated by Samsung, SK Hynix and Micron. Since none of these three top suppliers intend to significantly expand their production capacity, high prices will also continue next year and provide them with healthy profits. The global top three smartphone brands and major suppliers of mobile SoCs all have offered hard- and software products including AI accelerators ICs and application development kits. “AI will have a major impact on the semiconductor industry in 2018,” said Jian-Hong Lin, TrendForce’s research manager. Lin believes AI would affect the semiconductor industry through two aspects. On one hand, AI would bring sales opportunities as related applications emerge with new products and technologies such as sensors, hardware accelerators, memory solutions and networking architectures. The arrival of these technologies would also spur upgrades for data centers and servers. On the other hand, AI is also being introduced into semiconductor fabrication as part of the transformation of manufacturing under the concept of Industry 4.0. Technology will play an increasing role in the manufacturing of various semiconductor products in 2018. Suppliers will have to employ new production models and differentiate themselves with advanced processing methods as they seek additional market opportunities and face various operational pressures. The global semiconductor industry is developing by leaps and bounds, and China is no exception. 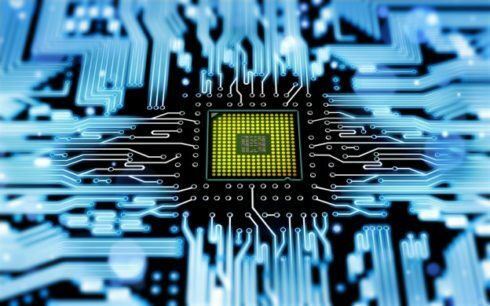 As the world’s largest semiconductor market, China since the issuing of its National IC Industry Development Outline has been energetically building domestic IC manufacturing capability. Furthermore, the establishment of the National IC Industry Investment Fund has also led to a wave of investments that has taken the domestic IC supply chain to the higher level of expansion. Numerous wafer fabs in China will be entering mass production during 2018, coinciding with the start of operation of many newly established domestic companies that focus on specific IC markets. The rise of Chinese IC suppliers will generate opportunities in CIS, driver ICs, memory, power semiconductor devices, MEMS and compound semiconductor chips. As Chinese enterprises make headways in these application markets, their compatriots in the upstream of the supply chain – including material and equipment providers – will also benefit. TrendForce’s Breakdown Analysis of the China’s Semiconductor Industry is published with the interest of those wanting to know more about the booming growth of China’s IC supply chain. This report contains detailed analyses on the related policies, fundraising programs and representative enterprises. The report serves as a comprehensive reference for enterprise clients when making strategic decisions. The large-size panel market was on the seller’s side from the third quarter of 2016 through the second quarter of 2017. However, supply began to noticeably outpace demand starting this third quarter, leading to falling quotes. “As BOE begins to mass produce LCD panels using its Gen-10.5 process, the global large-size panel market is forecast to see a glut ratio of around 8.5%, up by 2.5 percentage points compared to the projected 6% of 2017,” noted Eric Chiou, research vice president of WitsView, TrendForce’s display research division. The recent survey of various display technologies shows that OLED has gained significantly in the TV market this year as major brands such as SONY have opted for this technology in their high-end offerings. Chiou said that OLED TVs are going to be in a dominant position in the high-end segment. OLED TV set shipments are forecast to jump from 1.5 million units in 2017 to 2.4 million units in 2018, while the penetration rate of OLED in the smartphone market is forecast to advance from 28% in 2017 to 33% in 2018. In addition, 18:9 aspect ratio is expected to enter a period of widespread adoption in the smartphone market. Based on Chiou’s projection, device models featuring 18:9 screens are going to make up 9.6% of this year’s total smartphone shipments worldwide. This penetration rate would then soar next year, coming to around 36.2% of the global annual shipments. The increase in screen-to-body ratio will become a major trend not only in the high-end and mid-range market segments but also in the market segment of entry-level devices. 5G is able to expand the coverage of wireless communications, provide faster data transmission speed and decrease network latency. This next-generation networking standard will find applications beyond the consumer market to include vertical markets such as transportation, manufacturing and healthcare. Kelly Hsieh, research director of TrendForce, pointed out that 2018 would mark the dawn of the 5G era as South Korea will be presenting related solutions in the 2018 Winter Olympic Games at Pyeongchang. It is expected that mobile carriers worldwide will also become more receptive in 5G adoption. On the technology side, 5G technology employs multiple-input multiple-output (MIMO) antennas and transmissions in millimeter wave (mmWave) frequencies to achieve breakthroughs in the integration and framework development of wireless technologies. The higher frequencies inherent to 5G pushes up the demand for radio frequency components with higher power density and better performance. For instance, the gallium nitride (GaN) market is of huge potential since this material meets the high frequency requirement of 5G for power amplifier (PA) applications. Moreover, the deployment of 5G MIMO technology in base stations increases the number of antennas in each station. This in turn will promote research and development of core technologies related to antenna systems and device-to-device (D2D) solutions. After mobile networking made the general transition to the 5G standard and the related applications have been established, specifications of smartphones and other end devices will be raised to support higher carrier frequencies. The total value of the global market for RF front-end components used in cell phones is forecast to grow from US$11 billion in 2017 to around US$26 billion in 2022. The IoT market has seen rapid growth since 2017, penetrating deeply into various vertical applications. The highlight of the 2017 IoT market has been “smart interaction and connectivity.” The next focus in 2018 will be “smart management.” In the consumer IoT market, voice-based intelligent personal assistants have open up new possibilities in the interaction between users and their devices. These services enable users to have better control of their devices with a more intuitive interface and have made coordinated, synchronized operations among devices a necessity. Jimmy Liu, TrendForce’s IoT analyst, stated that as the technologies behind voice-based intelligent personal assistants continue to advance, the level of acceptance for consumer IoT devices will also increase. Next year will see more of such services being launched. As for the non-consumer IoT market, the emergence of edge computing has helped improve the computing capability of hardware. The introduction of edge computing into industrial applications allow for shorter response time and more instantaneous feedback. Furthermore, this approach will reduce costs related to data transmission and cloud storage/processing. In the future, edge computing is expected to be rapidly deployed by various enterprises. With the increasing number of connected devices, “smart” functionalities will grow and system efficiency requirements will be raised. This create demand for key solutions that will efficiently and intelligently manage IoT products and services. As the general development favors the simplification IoT architecture as well as the expansion of the IoT ecosystems, obtaining smart, integrated management solutions will be the next milestone in this market. OLED display has become a must of premium smartphones. However, limited production capacity and Samsung’s dominance in this market compels Apple to develop an alternative display technology as a substitute and a competitor. Roger Chu, research director of LEDinside, the LED research division under TrendForce, stated that Micro LED is the next-generation display technology that Apple is currently developing. Due to Apple’s engagement, a growing number of international technology giants are also entering the Micro LED market via investments and acquisitions. However, there are high technological barriers to the mass production of Micro LED displays. The companies working in these three major fields – LED, panel and semiconductor – need to cooperate as to overcome the manufacturing challenges. TrendForce’s industry analyst Christy Lin pointed out that the push for autonomous vehicles, drones and smart factories has shifted the focus in AI application development from solutions based on cloud computing to ones based edge computing. The rise of edge computing has enabled AI-powered services and products to function smoothly in the absence of cloud support. With the advent of edge computing, various AI-related applications are expected to enter practical implementation in 2018. Server demand has taken off in the era of IoT and AI. However, servers for AI applications are different architecturally from those used in high-density computing. DRAMeXchange analyst Mark Liu noted that Asian server manufacturers will see more growth opportunities related to structural changes in the industry and advances in computing power of server units. In short, server manufacturers in China such as Huawei, Sugon, and Inspur together with those in Taiwan will become the beneficiaries. According to Tim Pai, TrendForce’s senior industry consultant, the development focus of the automotive industry has transitioned from power mechanics to digital systems, with increasing efforts to find intelligent and autonomous driving solutions. Under this context, the realization of self-driving cars is on the horizon with the integration of automotive sensors, big data processing and improved AI algorithms. However, the popularization of self-driving vehicles still has to overcome several difficult hurdles such as raising consumer confidence, establishing a legal/regulatory framework and building the supporting infrastructure. China’s industries have entered a new phase in their upgrade and structural transformation during 2017. Due to the drafting of Double Integral Policy by the Chinese government, new energy vehicles as a concept has been embraced by not only the auto makers in China but also the entire global automotive industry. These policies furthermore influence the long-term strategies of the battery industry. TrendForce estimates that batteries used by new energy vehicles worldwide for the entire 2017 will exceed 37GWh, of which passenger-class vehicles will account for 17GWh and buses will make up 15GWh. The total number of new energy passenger-class vehicles worldwide is set to grow steadily by 25% year on year in 2017. The total number of new energy logistics vehicles worldwide is projected to post the highest annual growth for the same year at around 50% on account of the new round of subsidy from Chinese government. The year-on-year growth for new energy logistics vehicles will fall back to 31% in 2018. For the battery industry, Duff Lu, senior research manager of EnergyTrend – the green energy research division under TrendForce, pointed out that the use of batteries with ternary cathode materials in new energy vehicles has expanded significantly in recent years as their technologies gradually mature. The penetration rate of ternary batteries in the global market for new energy passenger-class vehicles has risen from 45% in 2015 to an estimated 70% in 2017. As for new energy buses, they still rely on batteries with LFP cathode because of cost and performance considerations. Nonetheless, the penetration rate of ternary batteries in the global market for new energy buses is projected to increase to more than 10% in 2017. The latest survey on subsidy rules and mainstream offerings indicate that major players in the industry will become even larger. In the future, apart from innovations in supply models resulting from cross-industry alliances, improvements in product specifications will play an important role in the strength of the enterprises. It is also worth mentioning that cobalt prices have recorded a five-year high in 2017, and the market for this metal is expected to be bullish in the long term.